We live on a very beautiful planet. It is huge and vast and there are so many amazing places that a traveler can visit. Each year we contemplate on where to go and visit in order to enjoy our time away from our daily lives, work, family and so on. We read reviews, talk to friends, family and then try to decide where it is this year we will get-a-way to. Among these places, should the darling little city of Marmaris be in your travel schedule, then here’s a route that you might want to take. A change from the commercial tourism, a change from our daily routine, a change of scenery in a little piece of paradise. Our journey begins in the little charming village of Selimiye. 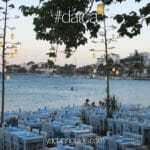 It is a place well known by the local Turkish tourists in the bigger cities of Turkey. But for what reasons – are many. It could be the very few fine dining (seafood feasts) establishments lined along its small coastline. It could be the panoramic views that surround the region from land and from sea. It could just be that it has the charm, peace and warmth that we look for in a quiet and scenic holiday – the overall atmosphere it offers. 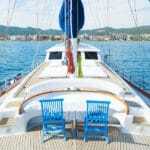 The yacht charter that we would be on board, for our little discovery of hidden and not so hidden paradise, is a gulet. This is a Turkish wooden boat, handcrafted by professionals in the meaning of generations – a trade passed down from grandfather to father to son. Nowadays they build them with more modern technology, but for the ones that are over 5 – 10 years old, it is a portrait of tradition and characteristic of the Turkish culture. Something almost out of a fairy tale story when you first lay eyes on it. They come in all sizes; with dark blues, deep greens, and most certainly all of them are varnished throughout. There are ones with light natural colors, but we call those motorsailers – not quite the gulet profile. 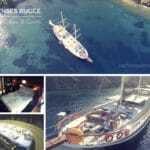 As the charter gulet is an altogether unique vessel with its mahogany, pine, and teak – the interior decor again all wooden, and ‘Turkish’ – even hand-carved furnishings can be seen. A 45 minute drive from Marmaris will bring you to the village of Selimiye. This sailing holiday in Turkey, takes us to many delightful destinations with private bays, secluded coves, little islands – filled with local village life, an ancient city, other ruins in between and the Greek island of Symi in the Dodecanese. But most of all, it offers plenty of fresh sea air, the Aegean sun, Turkish cuisine and great hospitality by the crew and locals alike. The feature destination in this trip can be just about all the places you will visit. However the highlight might just be the impressive and semi-preserved ancient city of Knidos on the Datca peninsula. It’s a area which may make you feel as though you have reached the ends of the earth. 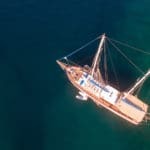 So if you are pondering the thought of a Turkish gulet sailing holiday, you might be interested in starting your journey in the paradise of Selimiye.